We've still got a day left until April Fools, so we're going to have to take Majesco seriously when they announce the return of their half-vampire, half-supermodel heroine this summer in the 2D side-scrolling platformer BloodRayne: Betrayal. Why take a franchise that did moderately well as a 3D action-adventure title and transform it into a 2D platformer? My guess is developer WayForward technology didn't have enough polygons to render Rayne's curves and decided to go the easier route. Either way, Rayne is back, and she's flatter than she's ever been before. That's no mean feat! "It's been a long time since Rayne captivated players with her bold mix of brutality and beauty, and fans have been hounding us to release another BloodRayne installment," said Jesse Sutton, CEO, Majesco Entertainment. "We are excited to once again partner with the creative and committed team at WayForward to bring Rayne back. 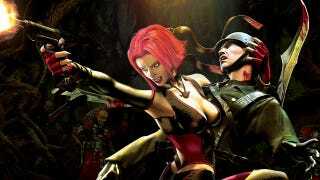 BloodRayne: Betrayal delivers the action-packed experience franchise fans have been waiting for in a digital format that's also accessible for new players unfamiliar with Rayne's over-the-top, stylized gameplay." WayForward Technologies knows how to take an older game and make it better, as seen in the recent remake of A Boy and His Blob for the Wii. They're also no stranger to creating new sequels for older franchise, having handled Contra 4 for the Nintendo DS. Perhaps they are just the developer to revitalize a series that's been through two and a half Uwe Boll movie adaptations. The story for this installment involves Rayne reluctantly teaming up with the vampire hunting Brimstone Society to "stop an evil vampire massacre." It is unclear if that means the evil vampires are being massacred, or the evil vampires are perpetrating the massacre. Whatever. Rayne will dress in skintight clothes and stab people with her arm blades. That's all that really matters. We'll see more as soon as Majesco has more to show us. For now, watch the official website and look for the game this summer on Xbox Live Arcade and the PlayStation Network.